SKIP-BO is a card game that is owned by the toy company Mattel, and it is based on traditional card games such as Spite and Malice and Cat and Mouse. 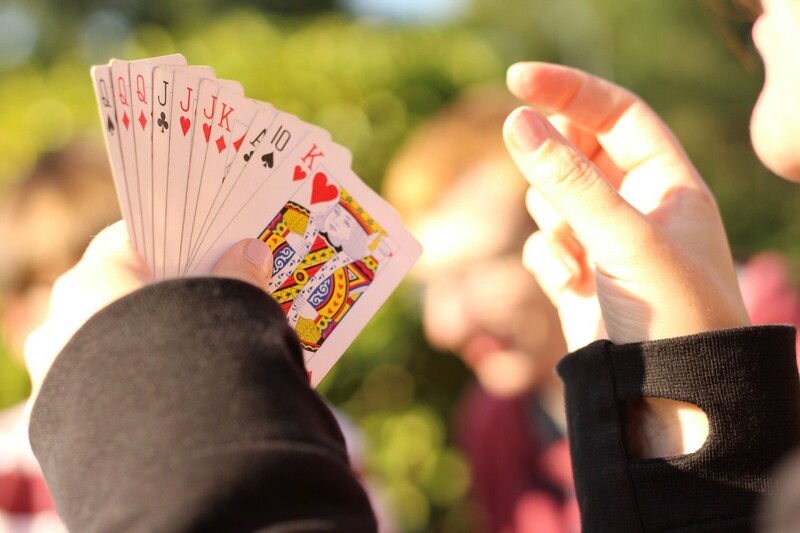 It is similar to Solitaire, but instead of playing alone, the SKIP-BO card game can be played with 2 to 6 people. Choose one person to be the dealer. 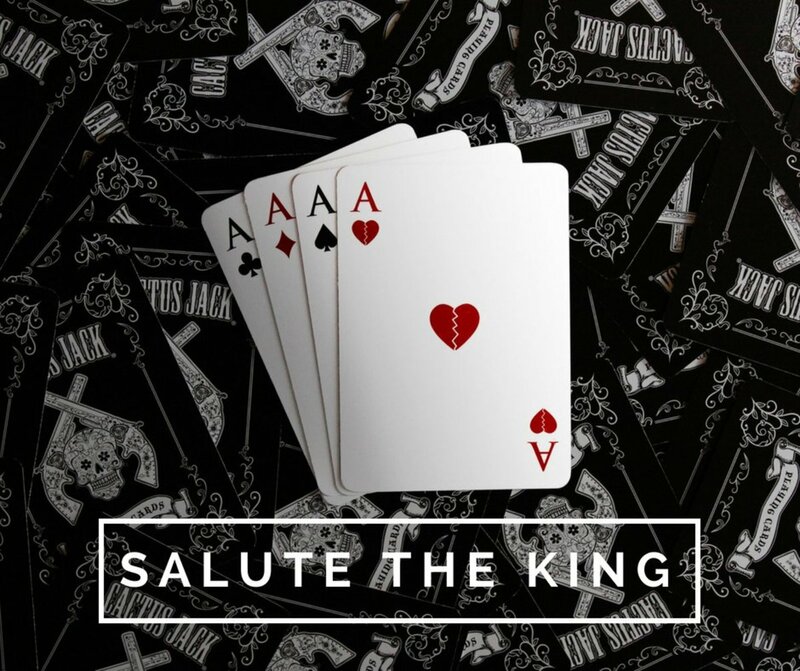 To start the game, the dealer shuffles the cards and hands each player 30 cards, placed face down. These cards should not be looked at or reordered. This pile of cards is called the stockpile. The object of the game is to be the first person to get rid of all the cards in their stock pile before any other players. Once each player is given their stock pile, the dealer takes the rest of the cards and places them in the center of the game play area. This is called the draw pile and will be the stack of cards where you draw new cards from. Place your own stock pile to the left of you. Each person flips the top card of their stock pile face side up and leaves it on top of their pile. This is the first card that you must get rid of in the SKIP-BO game. To determine who will be playing first, have each player draw a card from the draw pile. Whoever has the highest card can go first. Reshuffle those cards back into the draw pile to begin playing the SKIP-BO card game. In the middle of the play area there will be four piles called the building piles. The players will create building piles over the course of the game. The building piles are where the players will place cards in order, starting with “1” and all the way up to “12”, similar to the manner played in the game Solitaire. Once a building pile reaches “12”, it can be removed from the game, shuffled and placed back into the draw pile. 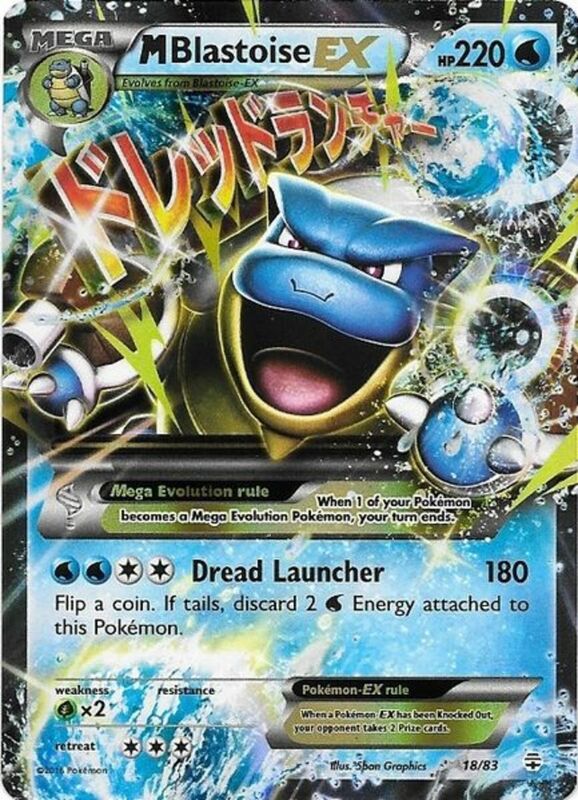 It’s important to note that at the start of the game, there will be no discard or building piles, these will be created as the game moves along. The maximum number of discard and building piles is four, you are not allowed to exceed four piles for discard and building piles. 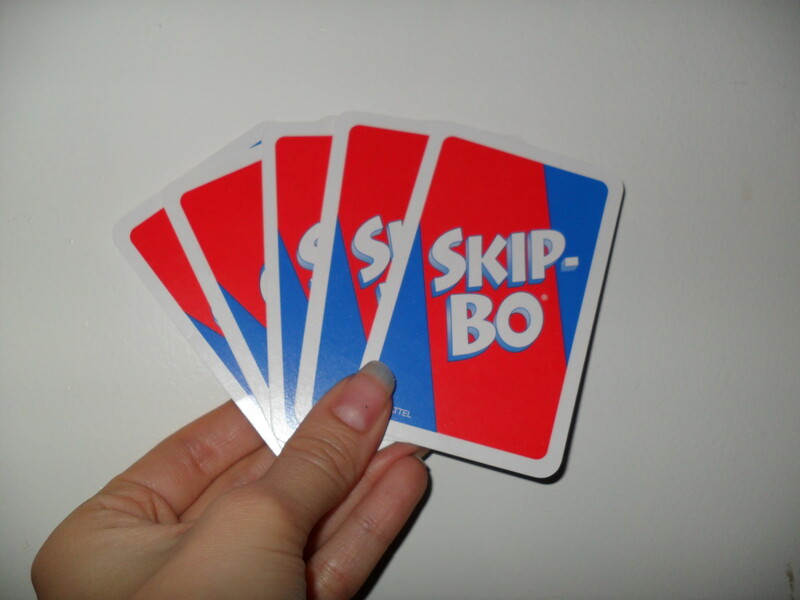 There are cards in the deck labeled SKIP-BO cards. SKIP-BO cards are wild and can be used to replace any numbered cards in the deck. On each person’s turn, they use the cards in their hand and the cards in their stock pile to add to the building piles, starting with the number “1”. 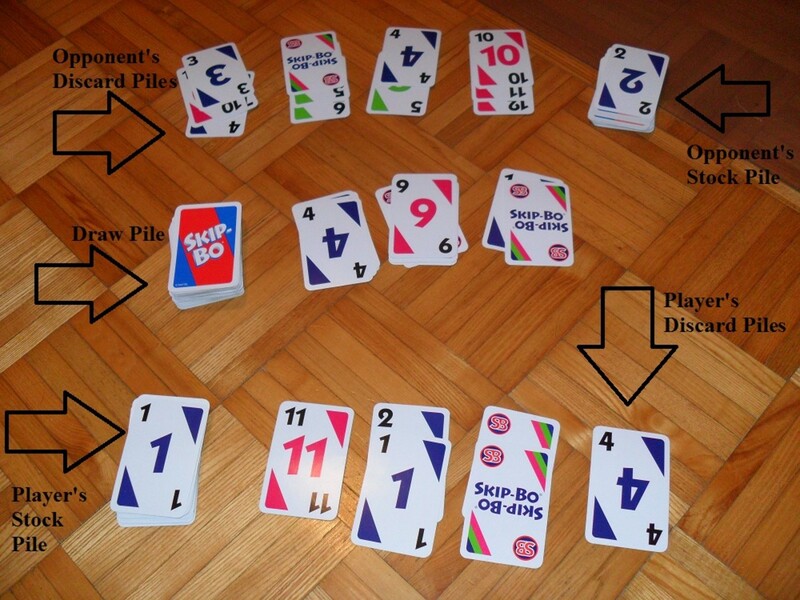 If they have either a “1” or a “SKIP-BO” card in their stock pile or in their hand, they can begin playing using those cards, placing the card in the center of the game by putting it in one of the building piles. Then if they have a card numbered “2” they can then play that card on top of the “1”, and so on and so forth until the number “12” is reached. If a player plays a card in the stock pile, they immediately turn over the next card in their stock pile and use that card as soon as they can. To start game play, the first player draws five cards from the draw pile. They do not show these cards to anyone. As mentioned before, if a player has a “1” or a “SKIP-BO” card they can use it if it’s their turn. 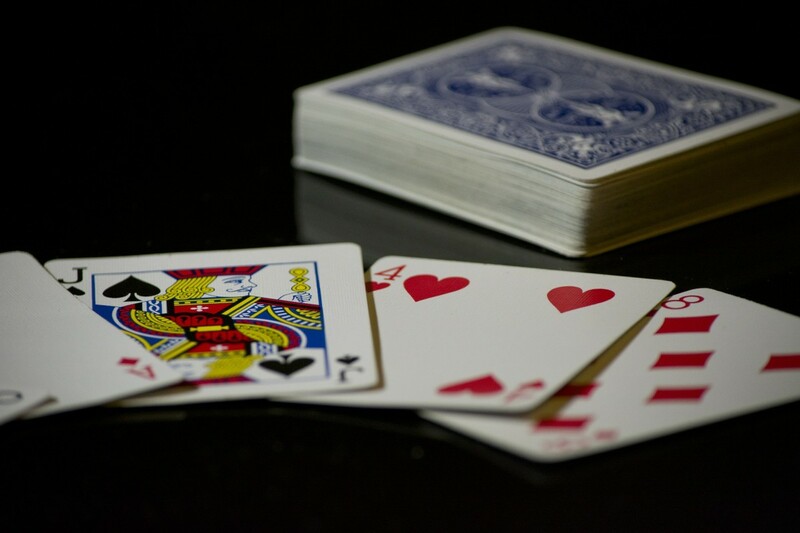 Once the first player can no longer make any more moves they must put a card in one of their four discard piles. Play then moves to the left and the next player draws five cards. 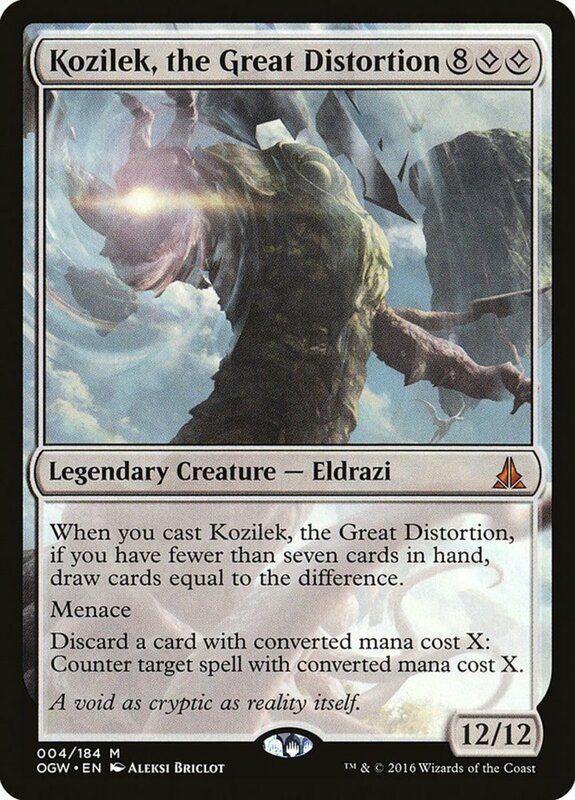 On your next turn draw as many cards as needed to have five cards in your hand. 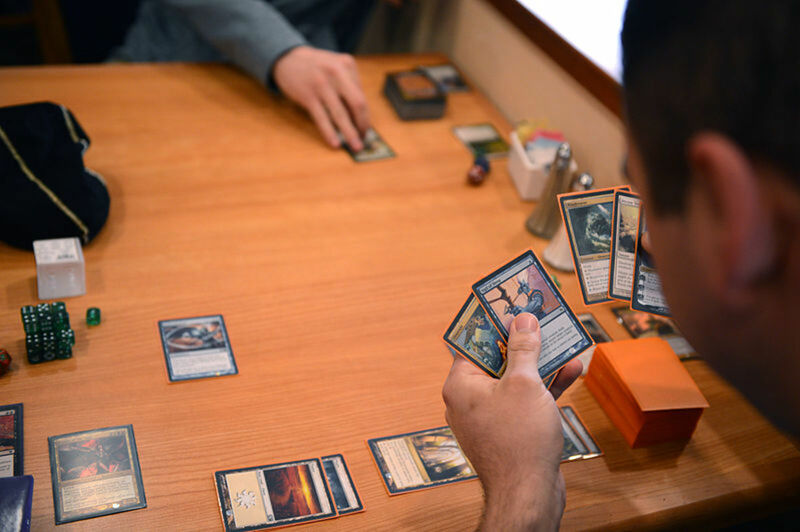 If a player uses all of the cards in their hand on their turn without putting in the discard pile, they can pick five more cards up and continue playing the game. Each player’s turn ends only when they place a card in the discard pile. The game ends when a player is the first to get rid of all of the cards in their stock pile cards. When playing SKIP-BO with 5 or 6 players, the game is played the same, but instead of dealing a stock pile of 30 cards, each person gets a stock pile of 20 cards. Some people play multiple games in SKIP-BO. If you want to keep score and play multiple games, the winner of each game will receive 25 points for winning the game, and 5 points for each card in their opponent’s stock pile. The winner is the first person to reach 500 points. Love playing Skip-Bo,dislike playing with the new set(brown) would like to find the old set(red,white,blue). Pls help me to get the kind I love to play. Will pay if you can send me some about 5.We love the old set. A great game. My wife and I play a couple of times a week, but the best time is in the summer months over at our caravan, where we play with more people. We have been playing for 12 years now and still love the game. I find that there are many different versions or variants of the game.